Campaign for the American Reader: Pg. 99: Amy Carney's "Marriage and Fatherhood in the Nazi SS"
Pg. 99: Amy Carney's "Marriage and Fatherhood in the Nazi SS"
Featured at the Page 99 Test: Marriage and Fatherhood in the Nazi SS by Amy Carney. From 1931 to 1945, leaders of the SS, a paramilitary group under the Nazi party, sought to transform their organization into a racially-elite family community that would serve as the Third Reich’s new aristocracy. They utilized the science of eugenics to convince SS men to marry suitable wives and have many children. 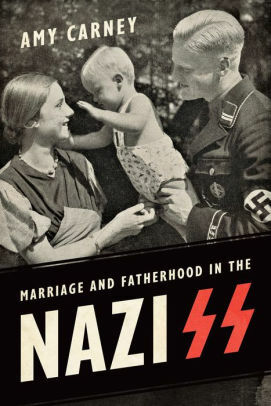 Marriage and Fatherhood in the Nazi SS by Amy Carney is the first work to significantly assess the role of SS men as husbands and fathers during the Third Reich. The family community, and the place of men in this community, started with one simple order issued by SS leader Heinrich Himmler. He and other SS leaders continued to develop the family community throughout the 1930s, and not even the Second World War deterred them from pursuing their racial ambitions. Carney’s insight into the eugenic-based measures used to encourage SS men to marry and to establish families sheds new light on their responsibilities not only as soldiers, but as husbands and fathers as well. The Page 99 Test: Marriage and Fatherhood in the Nazi SS.